Today Genoa booked a very important victory against Palermo, a concurrent in the race to the Europa League-zone. A goal of Antonio Floro Flores in the 77th minute decided the match that was played during constantly rainfall. Genoa is now 10 points ahead of the relegation-zone and 4 points behind number 7 Juventus. The next weeks have to tell us if we can try to reach European football or that we only have to play to reach the left-side of the standings and to be above Sampdoria which has 7 points less than us and is just above the relegation-zone. Sunday we play at 15.00 hours in Bologna. The halftime score was 0-1 by a great goal of Rodrigo Palacio. Within 10 minutes in the second half Inter scored 3 times (Pazzini and 2x Eto’o) and the match was over. 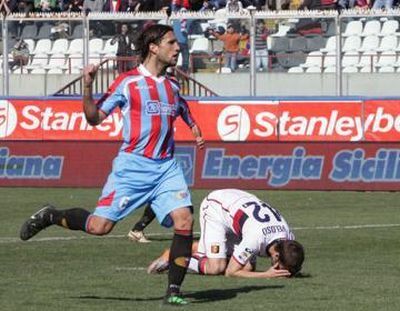 Just as in Catania it looked like they had put something in the tea of Genoa at halftime. During the rest of the 2nd half it was an attractive and friendly match with another 3 goals: Pandev and Nagatomo brought the score to 5-1 and Mauro Boselli, who substituted Paloschi in the 74th minute, scored his first goal with Genoa: 5-2. Genoa now is 12th in the standings with 35 points in 28 matches. Europe is far away at the moment. 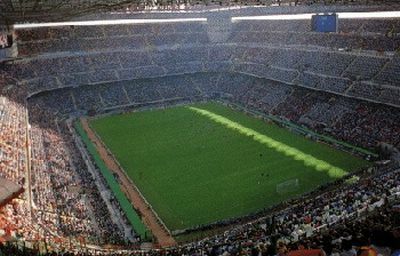 Tomorrow Genoa plays in Giuseppe Meazza against Inter with our ex-players: Ranocchia, Thiago Motta, Milito and Kharja. Genoa misses the banned players Criscito (heavily wanted by Liverpool, Tottenham and Zenith St. Petersburg), Floro Flores and Veloso, so maybe Antonelli and Boselli can finally be in the line-up. If we play like the first half in Catania it can be an interesting match. Catania-Genoa 0-1 + 2-0; what at halftime ? Genoa played a fantastic first half on the island Sicily. The score was only 0-1 by a goal of Floro Flores, while Marco Rossi hit the crossbar. Referee Giannoccaro also refused to give Genoa at least 1 penalty. After the halftime-break everything was different. Genoa played bad, Catania scored twice inbetween 4 minutes (51st en 55th) and Genoa received 3 red cards (Criscito, Floro Flores and coach Ballardini) within 3 minutes. This was also too much to referee Giannoccaro who gave Genoa a penalty to score the equalizer, but Veloso missed. Genoa stays on the 10th position in the standings, but the possiblity of qualification to European football is almost over.